I am all about getting the task at hand done in a professional manner, but in the shortest amount of time possible and that is why I love Cydia tweaks that increase my productivity. Today one of these Cydia tweaks was released an it is called OpenOnSearch. The OpenOnSearch Cydia tweak will make it so when you are using Spotlight you can open the first result by simply tapping the Search button. This is extremely useful if you know the query you will be entering will result in the first option being the result you want. Although OpenOnSearch is only going to shave milliseconds off the task at hand, it is a very intuiting shortcut that is worth having trust me. Some instances where OpenOnSearch is extremely beneficial is when you are typing commands like “call <insert contact name here>” or for opening applications you can’t find on your home screen. Nine times out of ten these queries will result in the actual action coming up first. 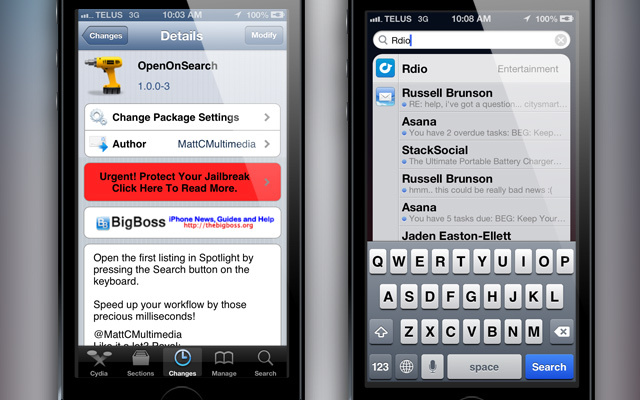 If you are interested in OpenOnSearch you can find it on the BigBoss repo for free. Let us know what you think of the tweak in the comments section below.